During the spring and summer, after school we would rush home for our tea. Afterwards we would spend the rest of the evening either out on Synwell playing field or down near the brook that ran through Gaston's Farm and was known to us as Gaston's Brook. 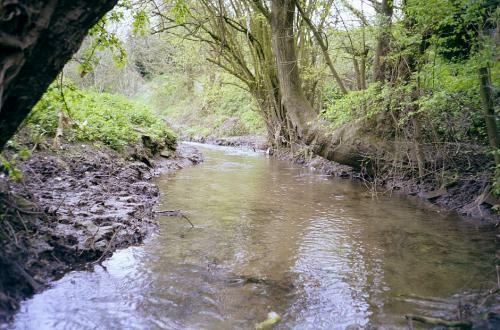 The Brook was only a short distance from Cotswold Gardens, if we tired of the playing field we would pass the word around saying that we were going down to the brook to play. With renewed interest we returned home to pick up our fishing nets, and a jam jar that had a string tied around the neck and looped across the top to form a handle. The fishing nets were merely bamboo canes, with a length of strong wire that was threaded through a white mesh bag and formed into a circle. The wire was then twisted to form a spike that was inserted into the fleshy centre of the bamboo cane. As we reassembled with our fishing tackle we set off clambering over the stile and racing across the field that sloped steeply down to the brook side. Sticklebacks and redthroats, inhabited the brook that meandered lazily through the three fields belonging to Farmer Gaston on its way to Potters Pond. The water took on a mottled effect, as the late afternoon sun shone through the leaves of the willow trees that lined the banks, their long slender stems of lime green foliage almost touching the water. The water flowed swiftly in the middle, deeper parts of the stream, while near the banks small ripples could be seen, as the fish came to the surface in search of food. Butterflies, moths, damselflies and the occasional dragonfly flitted majestically among the reeds and tall grasses growing at the water's edge. Some of the small fish that we caught in our nets were then put into the jam jars and taken home. Unfortunately, by the next morning we would find most of the fish had died and were floating on their sides. No matter how many fish we took from the brook over the years, their numbers never seemed to diminish. In the springtime we would use the same nets to collect frogspawn. We all watched anxiously over the following weeks, as the tiny black dots became larger, developed into comma shapes, and then, after they had eaten all the jelly food that had originally surrounded them, became muddy brown long-tailed tadpoles. We knew that it would be soon time to return them to the brook to continue their development into frogs. Many times I have returned home with wet shoes and socks, and sometimes soaked to the skin having fallen in off the very wet and slippery bank. Once we tied a rope to one of the willow trees to enable us to swing out over the stream. The brave among us were successful and swung several times across the water, some landing on the opposite bank and waiting for the rope to be pushed back to them for the return swing. On several occasions the weight of two on the rope was too much for the branch to bear resulting in it snapping off. We then had to find another branch to fix the rope to. The folly of these exercises resulted in an early bath and an early night in bed for many of us. We soon abandoned that idea. One fine evening, in late spring, we were playing as usual near the brook when my best friend – Paul Brain – saw his older sister Molly walking down the field towards us, calling out for Paul. "Paul! Paul! Come on, it's time you were home". "Oh, no I'm not ready yet", came Paul's reply. "Come on now, if you don't, you know what our mam'll do to you", insisted his sister. "I don't and I'm not coming home yet"! Retorted Paul steadfastly. "You'll come now if you know what's good for you", shouted Molly, finally. With that Paul took flight, and started to run away from his sister towards the stream. Now, Paul being a bulky lad for his age ran at the brook in an attempt to jump to the other side. What he hoped to achieve by this was not clear, unless he intended to run off up the lane – that ran along side the farm outbuildings - and on to Coombe road. Needless to say Paul failed in his attempt. I shall never forget this sight as long as I live. In his failed attempt to clear the brook Paul was now sat, up to his armpits in mud and murky water. The only clean part on his body was his ginger hair. Laugh? We nearly cried. After his sister had managed to pull him out, Paul stood on the bank soaked to the skin. There was water coming out of his shirt, pockets, and oozing out of his one remaining sock and sandal as he shuffled from one foot to the other. "Come on you, let's get home", his sister ordered, angrily. "And why not?" begged Molly. "I've lost my sock and sandal in the water" Paul replied nervously. In the meantime one of the others had spotted Paul's sandal in the water and had retrieved it for him along with his sock. This was done with the aid of a large twig, which was inserted into the water enabling Paul's sock and sandal to be retrieved. "God knows what your mother will say when we get home, my lad". With that Molly and Paul started off across the field towards home. I can still see it now, as Paul and his sister walked up the slope of the field, water was still running down his legs from his short trousers. Hand in hand they went, with Paul jumping now and then to avoid the many short thistles and cow pats that littered the field. I don't think Paul ever told us what happened when he got home. As spring progressed into summer we could be found playing amongst the hay. This was on land owned by another local farmer, Mr Richings, who gave us his permission, as long as we kept well away from any farm machinery. During the warm weather we wore only shorts and sandals. We built fortresses for ourselves with the bales, to keep out imaginary enemies. While we played our bodies became hot and sticky and this meant that the loose hay that came off the bales would stick to our skin and tickle us as it worked its way into our shorts and socks. If we removed our shoes and socks the stubble in the hay field would feel hard and prickly on the soles of our bare feet. The hay smelt sweet. Little did we think then that this was the only source of food for the cattle during the long winter months. Sometimes older lads would come and chase us away from our fantasy world, so we would beat a hasty retreat in a cloud dust thrown up by the very dry conditions. The long school holidays of summer would find us out on the hills and in the woodlands that surround Wotton-under-Edge. We would set off from home after breakfast, and not return sometimes until early evening. Sometimes darkness would be falling before we reached home, and some of our parents would be out looking for us. Meals would never bother us. If we felt hungry we settled for a diet of fruit and berries. We knew the location of orchards that we could raid, giving us a plentiful supply of apples and pears and later in the year walnuts. A few of us would enter the orchard, with orders from the others as to what pears or apples they preferred. Those of us that went into the orchard came out with our pockets bulging with fruit and our shirts tucked in our tightly belted shorts so that we could carry more fruit inside them. The others acted as lookouts in case the owner of the orchard, or the local bobby made their presence known, if we were spotted we scattered in all directions so as to make it impossible for them to catch us. Although we never got caught, somehow or other when we returned home our parents always seemed to know what we had been up too. We were never punished for our escapades, just told to be more careful in future. Late August and into early September we could be found out on the hillsides again, this time to pick blackberries, that we could hopefully sell by the basket, to Mr Rufus Morley, the owner of our local hardware store, who used them to make home-made wine and jam. These are a but a few of the lovely memories I have of growing up in the picturesque town of Wotton-under-Edge and of all the friends that I left behind when we left for Dursley in February 1951. This is an ongoing project of mine, so watch this space. At this time of the year I always get homesick for England. I now live in the beautiful State of Kentucky. USA. However, reading Terry's article made me feel close to home and to the old friends we used to share, Paul Brain, Terry Smith, Ted Chappell, Pete Downs, Robert and Rodney Carter. I have kept in touch with my girlfriend but I often think about the boys we knew and wonder where they are now and what they are doing. Thank-you so much for displaying Terry's article on your web site.